Ibuprofen and acetaminophen are the most commonly used over the counter (OTC) pain killer medications. These drugs work for mild to moderate pains, but are proven to be inefficient in relieving some serious pains and discomfort. For this purpose patients may use stronger medications like Percocet. Percocet is actually combination of two painkiller drugs: acetaminophen and oxycodone. As mentioned, acetaminophen is useful for treating milder pains, but the other substance present in Percocet - oxycodone is narcotic painkiller with much stronger effects on the pain. It works by numbing painful area of the body and thus relieves the pain. It can resolve moderate to severe pains after some surgical procedures or some physical traumas and injuries. Patients suffering from chronic pains may also find significant relief using this drug. Pain associated with cancer may also be treated using Percocet. Age of the patient is the most important thing when it comes to determining exact dose of Percocet. Because of that children always use much lower doses than adult patients. People suffering from hypothyroidism (underactive thyroid gland) or hypertension may also require lower doses of this drug. There are various Percocet tablets available on the market, containing different amounts of acetaminophen and oxycodone. This is specified on the label of the pills, so if it says something like 2.5/325mg this means that the tablet contains 2.5mg of oxycodone and 325mg of acetaminophen. Adult patients suffering from severe pains due to surgical procedure or some kind of injury may be prescribed with 2.5/325mg Percocet tablets and they could use maximally 4 to 8 of these pills per day, every 6 hours. Some patients may need higher doses of oxycodone for their pains. For them, there are 5/325mg Percocet tablets, which should also be taken every 6 hours. Maximal amount of these tablets must be under 8 tablets per day. Additionally, there are also 7.5/325mg Percocet pills, which are even stronger than the tablets mentioned earlier, as well as some 7.5/500mg and 10/325mg Percocet pills. The last resort for severe pain are 10/650mg Percocet tablets. A person may use up to 4 of these tablets a day, each tablet 6 hours after the previous one. As mentioned, Percocet is prescription drug and you have to consult your doctor about these tablets. Normal doses of Percocet may cause side effects like nausea or dizziness, but these are not serious problems and they don’t require any treatment. Overdose of Percocet must be immediately taken care of because of potentially serious medical problems. 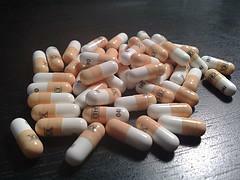 Percocet may interact with some medications such as other painkillers, sleep-inducing drugs or antidepressants. For that reason, patients using these drugs must consult their doctor about possible drug interactions.